Daily Mining Gazette/Garrett Neese Gov. 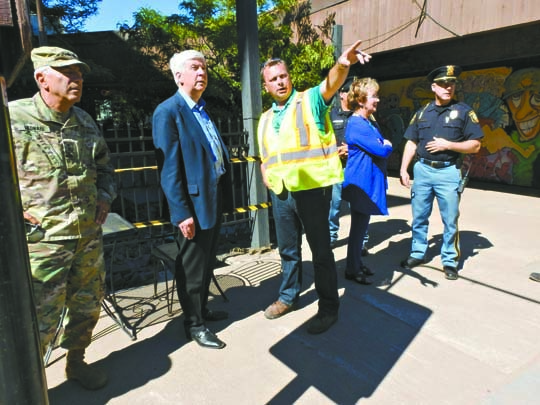 Rick Snyder listens to Houghton City Manager Eric Waara describe the path of floodwaters down Dodge Street in Houghton during a visit in June. Snyder Friday authorized the state to provide $3.7 million in matching funds required under the Federal Emergency Management Agency's public assistance program. HOUGHTON COUNTY — The state of Michigan will help cover the 25 percent local match required by the Federal Emergency Management Agency (FEMA). Now authorized to match approximately $3.7 million, the move by Governor Rick Snyder will aid the local municipalities of Gogebic, Houghton and Menominee in paying the matching costs. Snyder announced the move in a release Friday. Citing the initial three-county estimate of 29.8 million in damages the local FEMA match comes to $7.4 million, the release stated. That leaves half of the percentage to local municipalities. The match is only for the FEMA public assistance program as Snyder’s appeal for individual FEMA assistance was denied by the agency earlier this week. State Rep. Scott Dianda issued a statement supporting the move. “The state’s contribution of more than $3 million is a huge help to our small communities because it means they won’t have to go broke in order to recover from these devastating storms and flooding,” Dianda said. “We’re very appreciative,” said Hancock City Manager Glenn Anderson. In Hancock, the state match is $940,000 the community won’t have to match for FEMA aid. That leaves the remaining half and a 20 percent match for Federal Highway Administration (FHWA) Funds. He’s hopeful the state will consider an additional supplemental appropriation to help with the remaining FEMA balance and the FHWA match. “If you total those up for the city, what’s left, we still have about $1.6 million… but I’d rather emphasize the thank you,” Anderson said.